Jealousy. Yep, it's probably envy that inspires so many people to go ga-ga about birds. They can fly, after all, and who doesn't fantasize about flying? Ask most people what superhuman talent they'd like to have, and they'll choose flight. 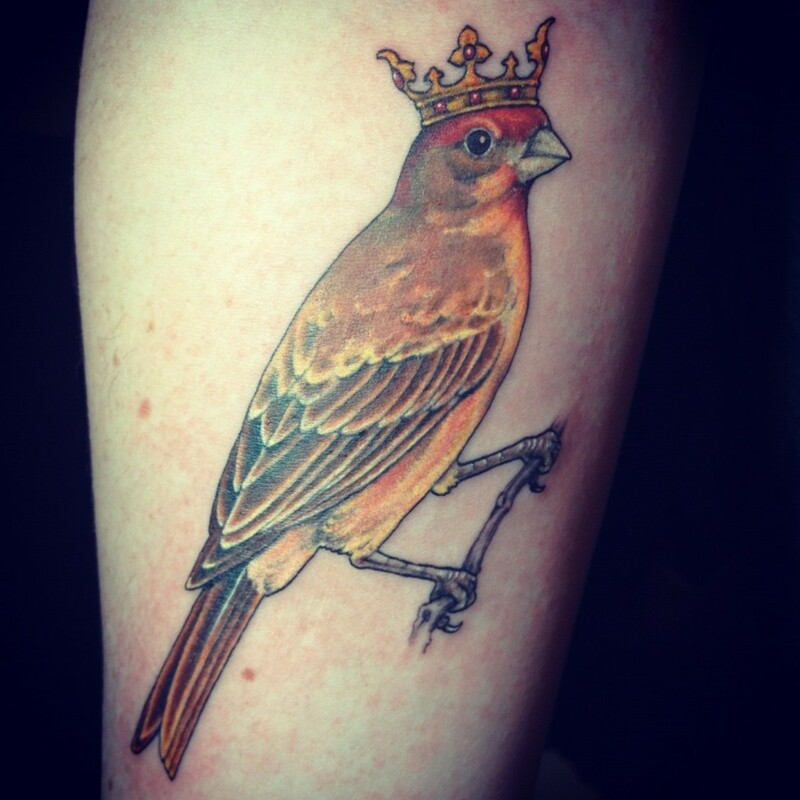 Getting a bird tattooed on your arm is as close as you'll ever get to having feathers. You won't be able to soar like a superhero but still, it's pretty cool. But what exactly does it mean? What does a bird tattoo mean? Birds can symbolize higher understanding, spirituality, or a communion with other worlds or realities. 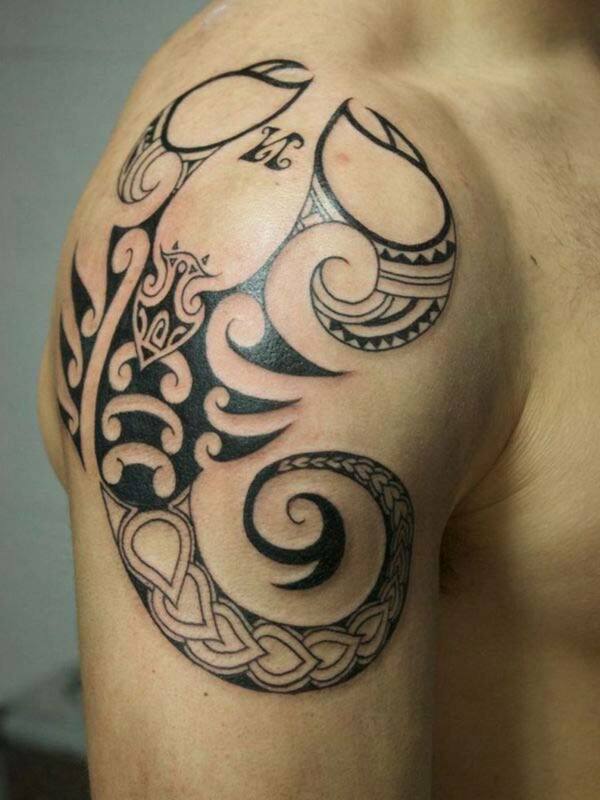 It represents freedom (mental autonomy, physical capability, spiritual self-direction, and freedom of choice). Connection: A bird can flit from the ground to the sky so it connects us with not only the earth but the whole universe. A bird symbolizes independence, self-sufficiency, and the power of self-direction and self-actualization. Perspective: The ability to detach yourself from worldly concerns and soar above it all, seeing the larger picture while remaining neutral and remote from petty concerns. Capability: Lightness, levity, buoyancy, agility, and facility, and the ability to rise above adversity. Fearlessness. Unless its a flightless ostrich with its head in the sand, a bird usually represents an audacious, indomitable daring to hurl oneself into the unknown. As a spirit guide, a bird encourages you to move beyond your comfort zone and dare to go higher and further: learn more, do more, be more. Yellow birds usually represent happiness and prosperity. Yellow songbirds have traditionally been kept as pets because they're like a ray of sunshine to cheer a room—and their singing adds to their cheerfulness. Whether it's is in a cage or not, a yellow bird might represent joy and cheer. Coal miners used to take canaries down into the mines with them as an early warning system: If the air was so toxic the bird died, the miners would know they needed to get out. Blue birds have been associated with happiness for many years and in many cultures. The blue jay, a corvid related to crows and ravens, is known for its extreme intelligence. Bluebirds have featured in folklore and mythology since China's Shang dynasty (1766-1122 BC), but are also seen in Native American, Russian, German, and many other stories. You hear about bluebirds in lots of songs and poems, too: In an old song by Cole Porter, "Be like the bluebird who never is blue, for he knows from his upbringing what singing can do," and in The Wizard of Oz: "If happy little bluebirds fly beyond the rainbow, why oh why can't I?" To learn more and see lots of examples, read Blue Jay Tattoo Meanings & Designs. 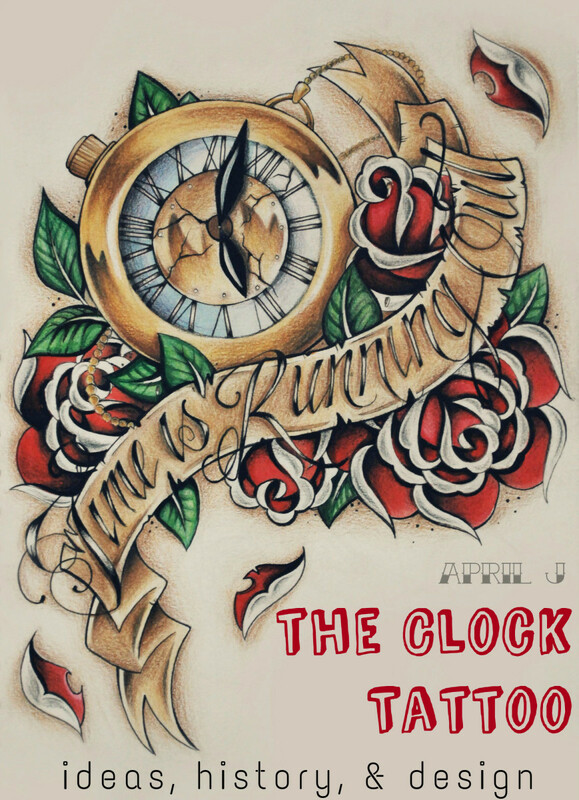 Roosters are cocky little birds—tyrants of the barnyard, swaggering around with their feathers all puffed up, waking everyone up with their crowing. They'll fight to the death, and many cultures still like to place bets on which rooster will win. Chickens are extremely fierce and territorial. In the flock, they observe a strict pecking order. A hen is a fertile and doting mother, carefully sitting on eggs and tending her chicks. Hens represent bounty, family, motherhood, and maternal instincts. Cranes are especially symbolic and meaningful in China and in Japan where they're believed to bring good fortune and a lucky union (which is why they're often folded into wedding kimonos). Traditionally, it was believed that if you folded 1000 origami cranes, your wish would come true, and origami cranes are also given in difficult times as hopeful gesture for healing and longevity. Doves often represent peace and love. They are mentioned often in the bible and are sometimes seen as representations of god's love. Also, in Genesis, after the flood, Noah sends a dove out to see if there's land, and when the bird returns with an olive twig in its beak it's a hopeful omen that the floods are receding. Doves were also associated Asherah, the Canaanite mother goddess, and Venus, the Roman goddess of love. Doves are also associated with purity, beauty, and gentleness. 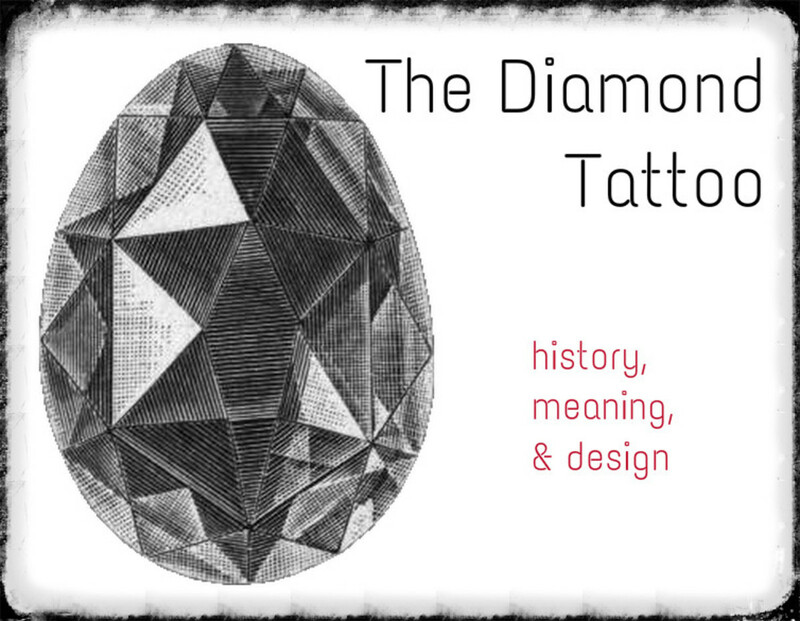 To learn more and look at lots of examples, read Dove Tattoo Designs, Ideas, and Meanings. The eagle is a somewhat masculine bird. . . but of course that doesn't mean only men can wear one. It's muscular, powerful, and agile... with those deep-set, almost omniscient eagle eyes. The Greek god Zeus had a giant golden eagle that worked for him. In 1782, the bald eagle was named as the U.S. emblem because of its majestic strength and virility. Many Native American tribes revere eagles as sacred animals that represent courage, strength, and vision, and use their feathers in ceremonies. If someone is "eagle-eyed," it means they are extremely observant and can see for miles. The tiny hummingbird—which represents alacrity, energy, and vitality—can fly 49 mph and its wings can flap up to 70 times per second. It's so fast its wings hum, but it can be hard to see. It is especially revered in the Caribbean, known as the land of the hummingbirds. It's also Jamaica's national bird and is pictured on its money. The ancient Aztecs thought hummingbird totems gave their wearer energy and life. A hummingbird packs a stunning amount of ability in its small frame, and so it can also represent the idea that small things are powerful. 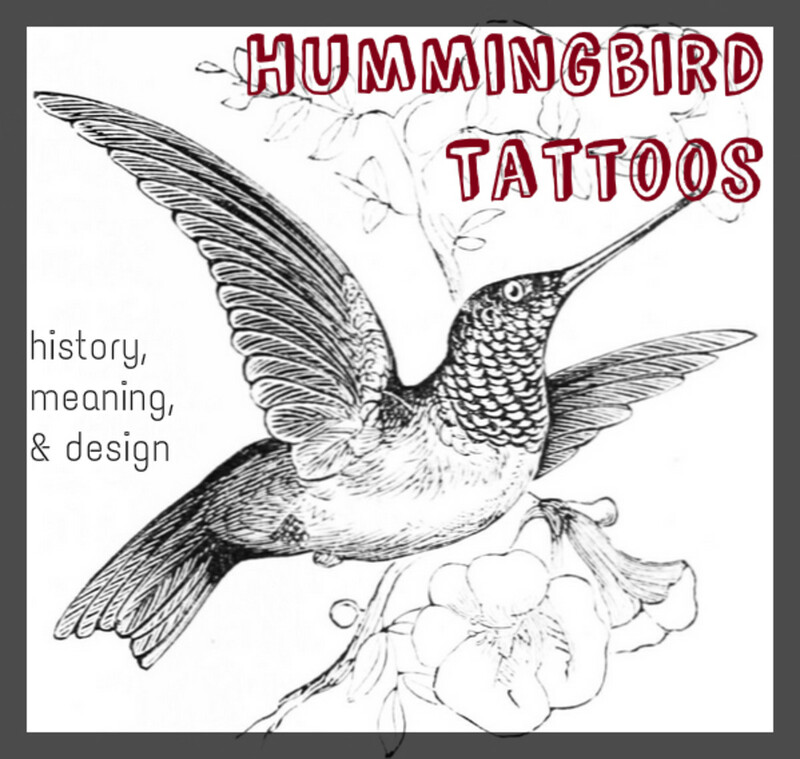 To learn more and see lots of examples, read Hummingbird Tattoo Designs, Ideas, and Meanings. Owls represent wisdom, knowledge, and truth. Perhaps it's those large eyes that make them look omniscient, although they do have extraordinary night vision. In many cultures, owls are spirit guides and ambassadors to the spirit world. The Greek goddess Athena, goddess of wisdom, was often depicted with an owl on her shoulder. So was Harry Potter (Hedwig's intelligence saved Harry many times). 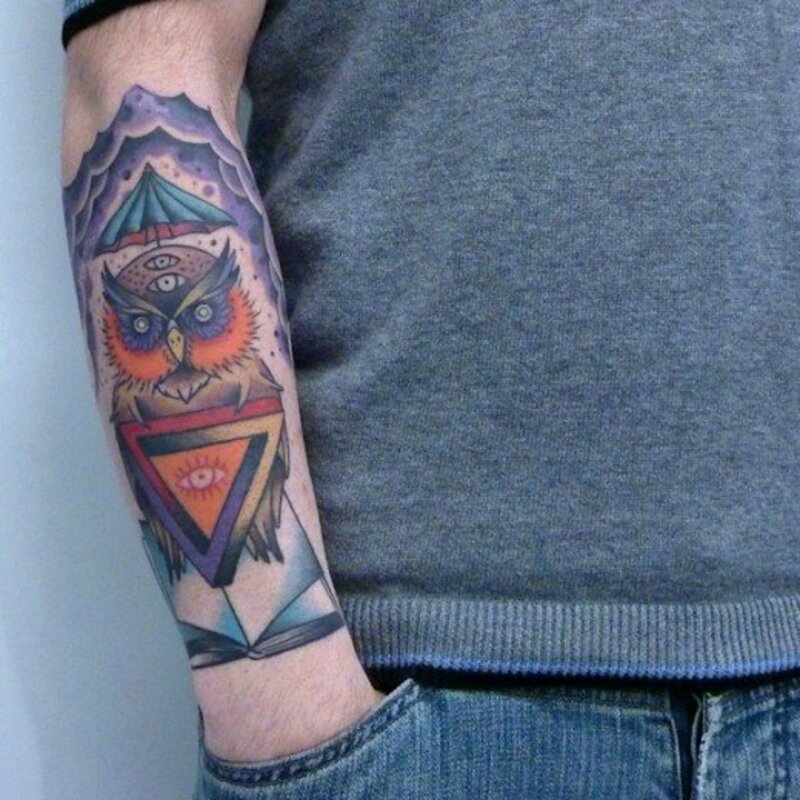 To learn more and see lots of examples, read Owl Tattoo Designs, Ideas, and Meanings. Colorful, flamboyant, playful, and clever. Because they can mimic human voices, parrots have a very special place in our hearts. We want to believe they understand what they're saying even they can't, and we attribute many human characteristics on parrots as a result. They also represent the canny rebelliousness of a pirate, especially when they repeat off-color phrases they've heard. 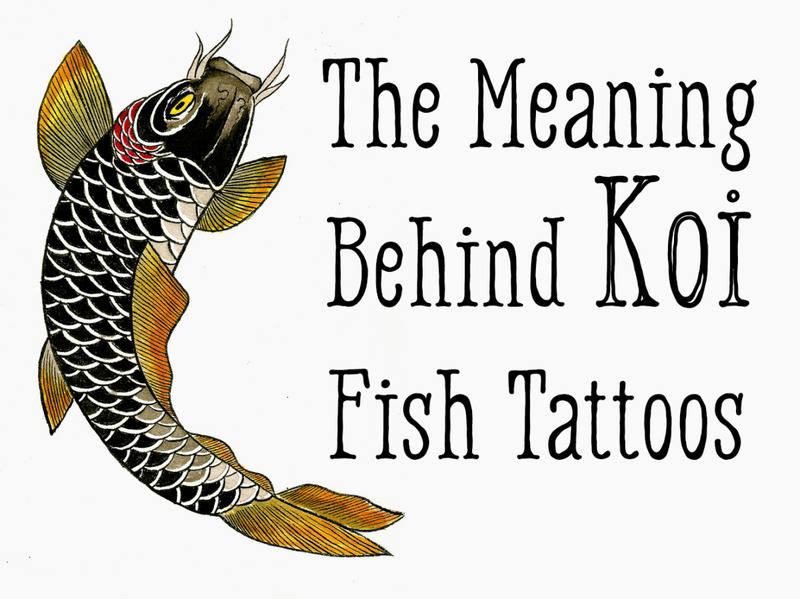 They represent communication, companionship, and family. Sometimes, they're called "proud" or "vain," but they really deserve to be pleased with themselves. What bird is more spectacular-looking than the male peacock? With its long train or fan of feathers patterned to look like colorful eyes, a peacock has a flirtatious, flamboyant flair for drama and spectacle. One of the most spectacular and evocative mythological birds, the phoenix self-combusts and is born again from its own ashes in an endless cycle of birth and death. A phoenix is a symbol of life, death, tenacity, persistence, survival, evolution, rebirth, and hope. Although a raven sometimes represents mystery and death, it doesn't have to be a dark symbol. It also represents intelligence, knowledge, wisdom, intellect, and communion with the spirit world. As a carrion bird (those that scavenge meat, including gulls, hawks, eagles, vultures, etc. ), a raven is often associated with the dead and seen a guide for spirits and a mediator between life and death. In Greek mythology, Apollo's ravens acted as the god's spies and as messengers between gods and mortals. According to Norse legend, the god Odin had two ravens that perched on his shoulders: Hugin (who represents thought or understanding) and Mugin (who represents a complicated mix of memory and desire). He would send them out every morning to circumnavigate the world, then they'd come back to share all the information they'd collected on their journey. In Native American traditions, the raven's task is to do what it must to manipulate humankind in order to bring light and wisdom to the world. In Edgar Allan Poe's poem "The Raven," the raven represents grief or a never-ending sadness for a dead loved one. 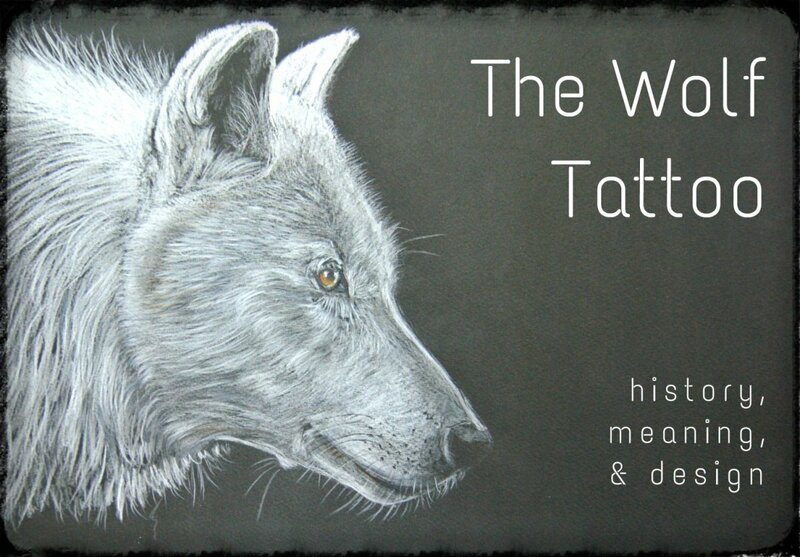 To learn more and see lots of examples, read Raven Tattoo Designs, Ideas, and Meanings. 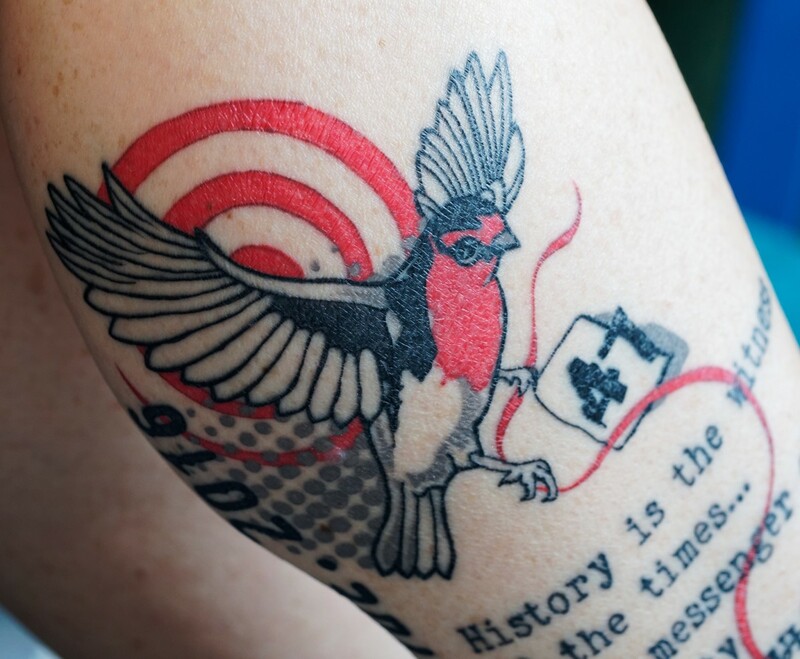 Swallows and sparrows are old-school tattoo designs, often worn by sailors as a symbol of hope for a safe journey. The ancient Egyptians believed they protected the souls of the dead. In prisons, you might see tattoos of swallows or sparrows that represent a battle against an unjust society. 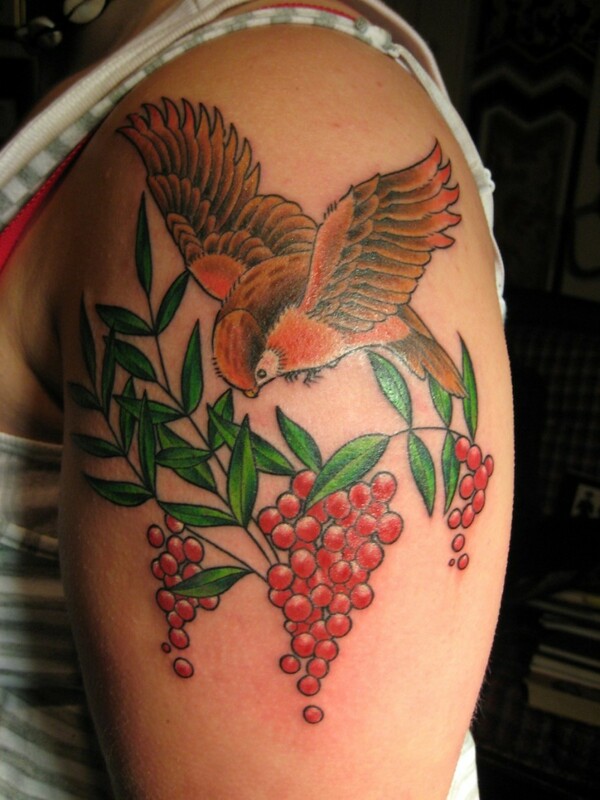 To learn more and see examples, read Sparrow and Swallow Tattoo Ideas. 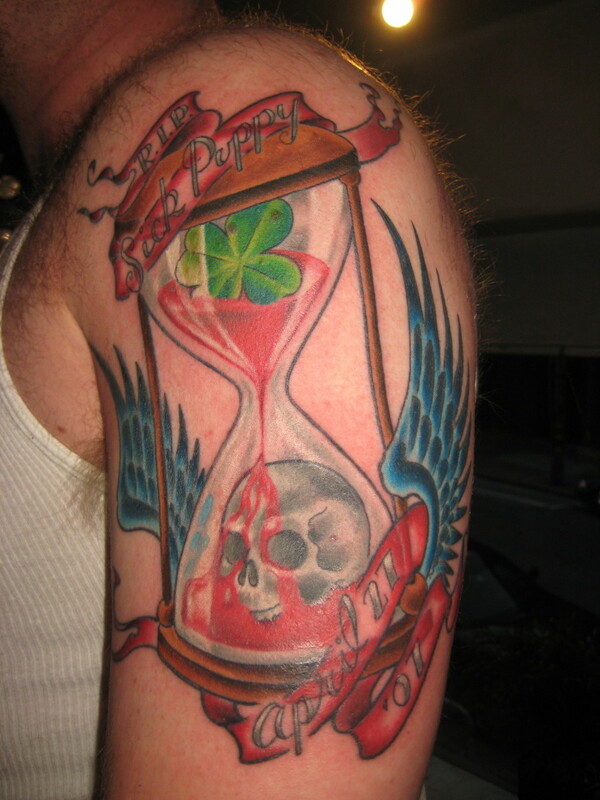 When designing a tattoo, there's no need to make it look realistic. You can work with your tattoo artist to create your own bird, one that looks however you want it to and represents whatever you decide. A bright orange crow, for example, or a half-bird, half-human. Your Frankenstein-bird might have a raven's beak, an owl's eyes, and a peacock's feathers. You can use your own imagination and invent your own mythology to go with it. In Native American cultures, feathers are believed to have power and deep significance and are often used ceremonially. Feathers are also used as ballasts on arrows to guide them where you want them to go. Instead of tattooing the whole bird, you want to do just one feather. In this case, it might still be meaningful to you to choose the style of feather and know which bird it came from. All feathers are not the same: Do you want an eagle, pheasant, crow, or peacock feather? Each different type of feather represents the whole bird it belonged to. 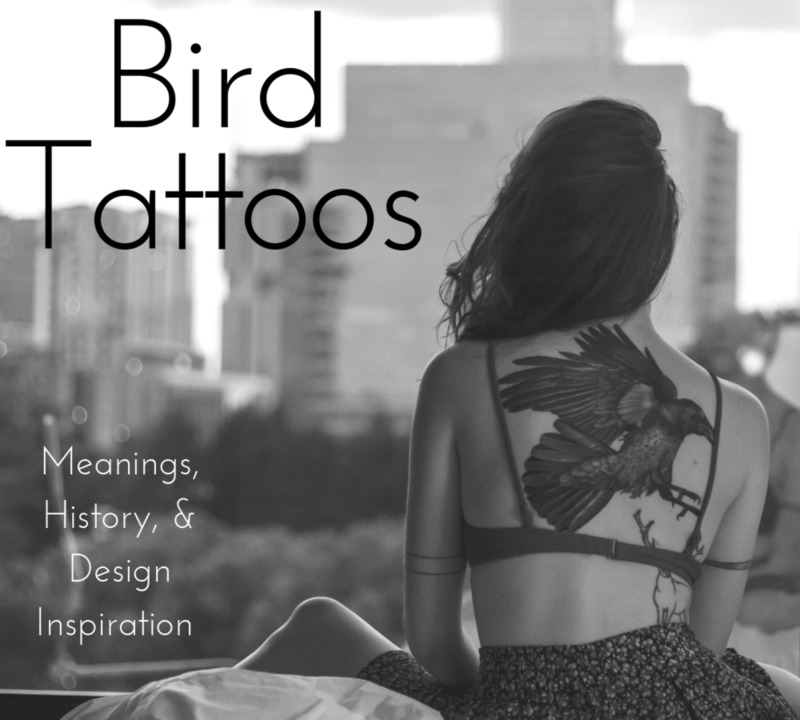 To learn more and see lots of examples, read Feather Tattoo Designs, Ideas, and Meanings. 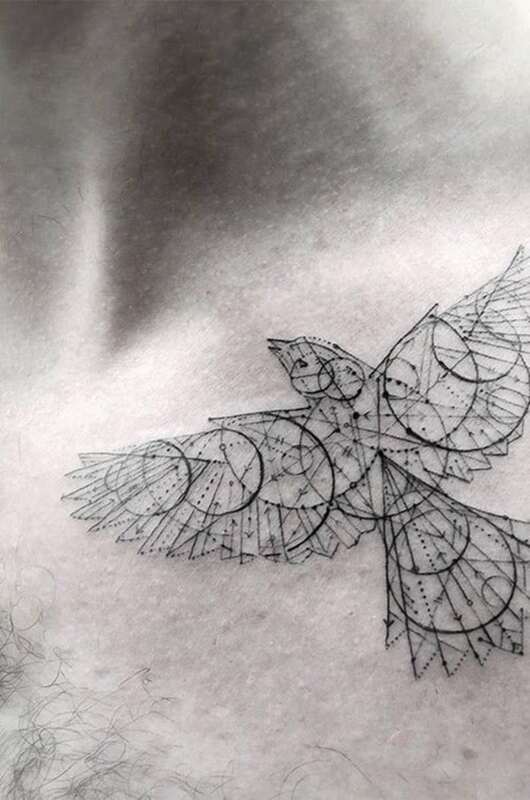 Or if you're considering a wing tattoo, read Wing Tattoo Meanings & Photos. Crows, ravens, black birds, owls, and phoenixes might all represent death, but they can also represent the spirit world, the afterlife, spirituality, or the death of a loved one, too. How much of the bird is shown? Choosing which bird is only part of the design process: How that bird will be shown is another. Do you want just one feather, a wing, the head, the whole body, or...? Do you want a profile or a view-from-above? 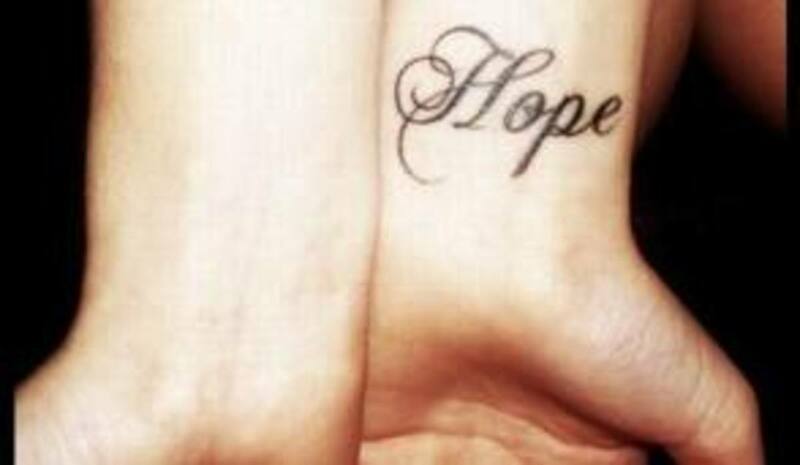 The more carefully you consider these options, the more unique and meaningful your tattoo will be. 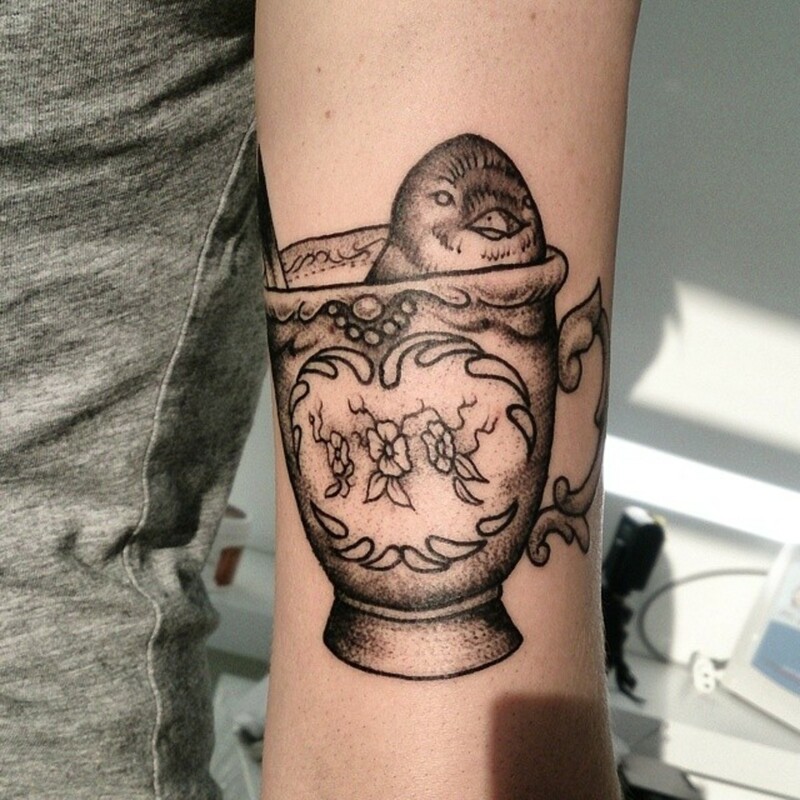 The bird's action affects the meaning of your bird tattoo. Is it soaring through the air, perching on a windowsill, landing on the ground, eating a worm, sitting in a cage, or grasping a bomb in its claws? As you can see, each of these actions adds a completely different layer of meaning or significance. Don't forget to carefully consider if you want color, and if so, how much. You don't have to remain faithful to realistic colors if you don't want to. Red conveys an entirely different feeling than blue, and rainbow has a different connotation than pink. You might want a black-and-white peacock, or you might wand a dark blue raven. You do any type of bird in all-black bird with just one green eye. Do you want just one bird, or more? Scroll down for more information about the significance of numbers. Old school, cartoon, photo realism, surreal, minimalist, steampunk, watercolor, cubist, woodblock, tribal... you can design the bird in any style you can imagine, so be sure to know all the styles and which you like before you go in to the studio. Do you want to incorporate other objects, symbols, or text? What Does the Number of Birds Signify? 1 is independent, focused, and starts it all. 2 is a partnership, a balance, a team. 3 and 9 are magic numbers. 4 is stable, pragmatic, down-to-earth. 2, 3, 4, 6, 8, and 10 are centered, whole, and can stand on their own. 5 is an energetic handful. Prime numbers (2, 3, 5, 7, etc.) are wild and nonconforming. 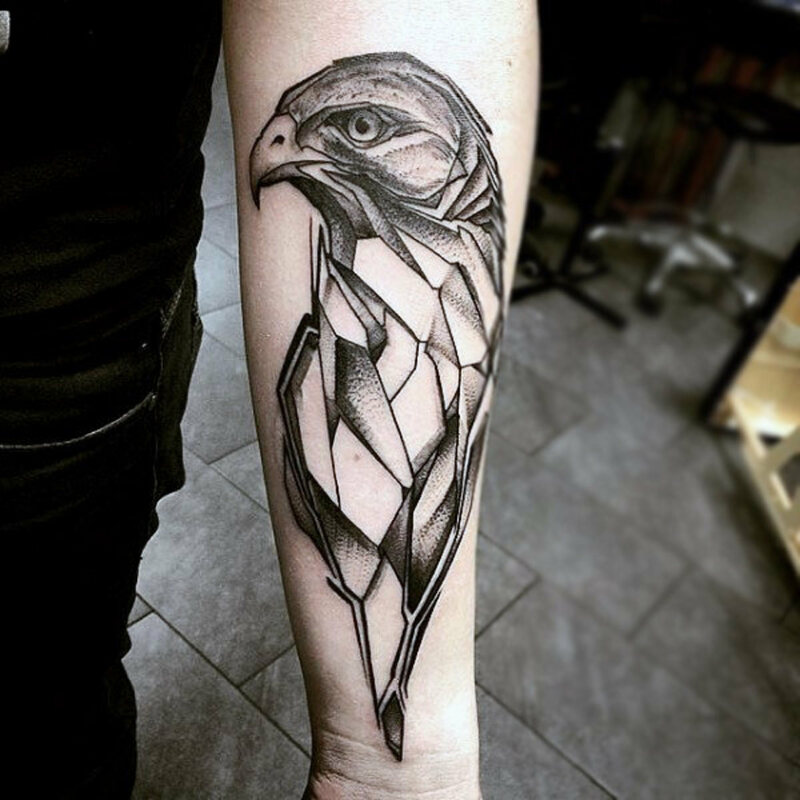 Which bird are you considering for your tattoo? A black bird: raven, crow, blackbird, buzzard, etc. A predatory bird: hawk, falcon, eagle, etc. 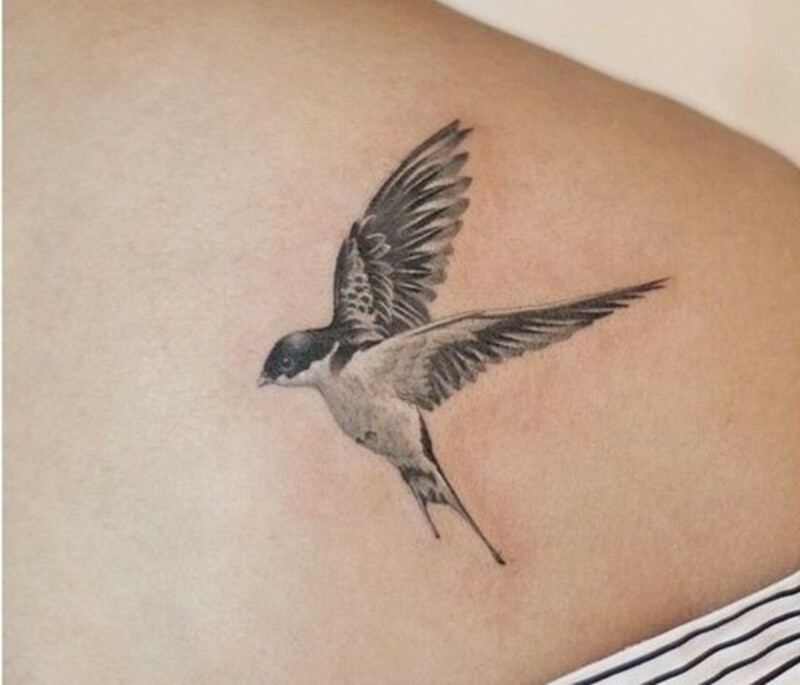 A small one: a swallow, sparrow, hummingbird, etc. A white bird: a dove, crane, stork, etc. Something unusual: peacock, flamingo, chicken, parrot, etc. A wise bird: owl, crow, raven, magpie, blue jay, etc. A spiritual bird: raven, owl, eagle, etc. I'm going to invent my own bird! 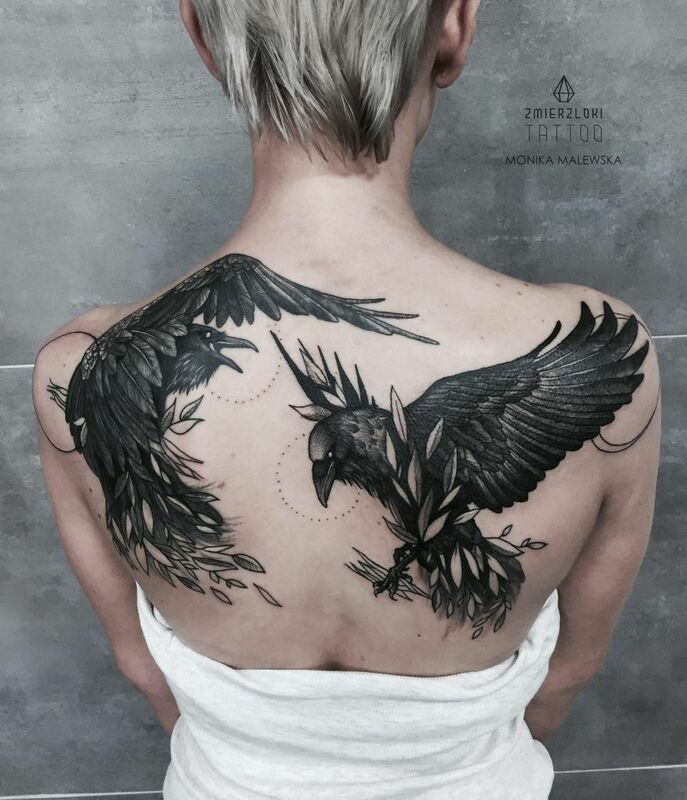 What could bird tattoos on the shoulder mean? Great question. For a start, I'd like to point out that that's an obvious place for a bird to perch: On your shoulder. Your shoulder is one of the most natural and pragmatic places for a bird to sit. I'm also thinking about the two crows or ravens that sit on the god Odin's shoulders. His crows would fly off to look at the world and then fly back, sit on his shoulders, and caw all the news in his ears. So a bird on a shoulder might represent your connection to a larger perspective or an invitation to a birds-eye-view of things. It could be a reminder to think about the bigger picture, too. 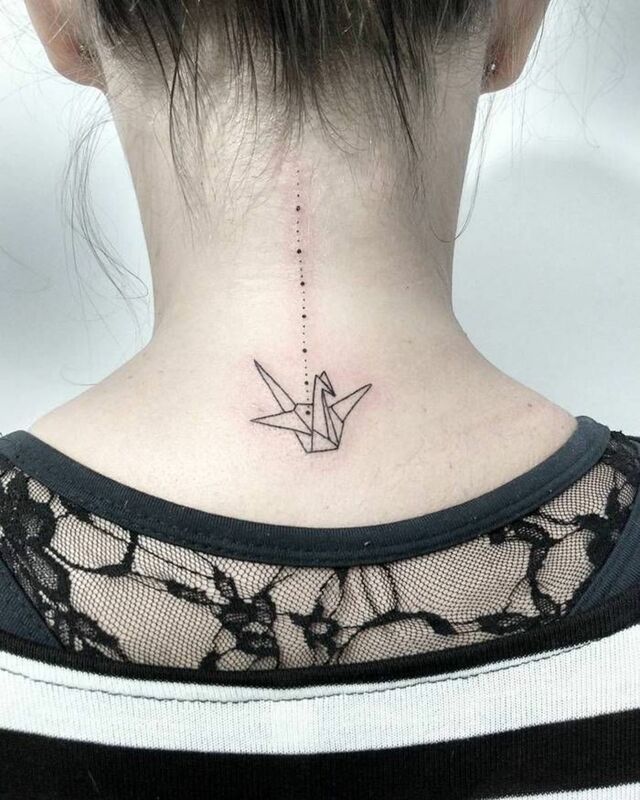 If we were birds ourselves, the shoulder would be the place where our wings started... so having a bird tattooed on a shoulder is like inviting flight or yearning for wings. Lastly, whenever I think about things on shoulders, I'm reminded of epaulettes, those regal shoulder decorations worn in ceremonies and celebrations.